The hubby is always reading to try and learn all he can to make our garden produce as much as it can. That’s why he was thrilled to receive a copy of Mastering the Art of Vegetable Gardening by Matt Mattus from Quarto Homes. Mastering the Art of Vegetable Gardening is your “201” level course in cultivating produce. Expand your knowledge base and discover options that go beyond the ordinary! Prepare to encounter new varieties of common plant species, learn their history and benefits, and, most of all, identify fascinating new edibles to grow in your own gardens. 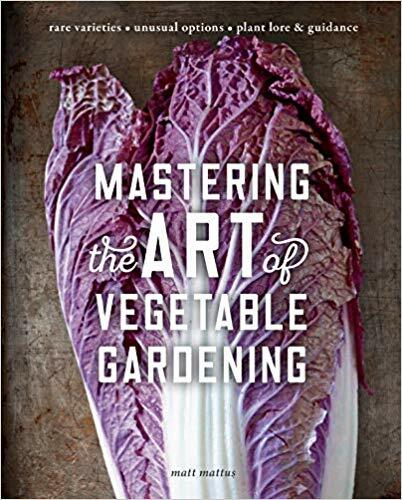 Written by gardening expert Matt Mattus, Mastering the Art of Vegetable Gardening offers a wealth of new and exciting opportunities, alongside beautiful photography, lore, insight, and humor that can only come from someone who has grown each vegetable himself and truly loves gardening. More than 200 varieties of vegetables and herbs from the 50 most popular groups are featured in hands-on profiles that tell you how, where, and why to grow each one. Take artichokes for example: They are far from the most common edibles home growers choose, but when and if you choose to grow artichokes, you’ll be fortunate to find more than one seed option, even at the better nurseries. In truth, there are nearly a dozen varieties of artichoke that are suitable for home growing in just about any climate, and each has its own unique benefits and characteristics. In Mastering the Art of Vegetable Gardening, you will find 10 types of artichoke described in through, loving detail—along with helpful tips on where and how to acquire seeds for each. And artichokes are just one item in this field-tested garden basket. Other popular and fascinating vegetables include: celtuce, Asian greens, cowpeas, carrots and parsnips, potatoes, parsley, and of course the tomato—you’ll find over two dozen varieties discussed. If you are one of the more than 800,000 folks per year who has begun growing vegetables at home, Mastering the Art of Vegetable Gardening is the reference you need to pursue this rewarding activity to a whole new level of excellence, satisfaction, and success. Matt Mattus is an American visual designer, artist, horticulturist, and futurist. He is also a third generation gardener of his family property in Massachusetts. Matt’s popular gardening blog Growing with Plants has garnered recognition in leading lifestyle magazines and is frequently voted a top five gardening blog. It has won many national awards and nominations and has earned a loyal following of fans. He has served for three years as a trustee of the Tower Hill Botanic Garden (Boylston, MA), is Vice President of the 175-year-old Worcester County Horticultural Society, sits on the board of theTower Hill Botanic Garden as a trustee, and is also President of the prestigious North American Rock Garden Society. Matt is very active in many plant societies and is a popular speaker at botanic gardens, specialist plant societies, and at horticultural conferences. For 28 years, Mattus was employed by Hasbro, Inc. in creative roles ranging from Creative Director to Visual Futurist in their top-secret Innovation and Invention Lab. Currently, Matt lives in Worcester, Massachusetts. There is a lot of information in this book. As noted in the synopsis above, Mastering the Art of Vegetable Gardening is not an entry level book. It’s a book for someone who already has the basics down. It is, though just chock full of information about all manner of vegetables. There are lots of beautiful photos to make what is essentially a reference book a pleasant reading experience. The book goes in to a deep dive for each vegetable it profiles offering up all you need to know about the varieties and how to grow them. It’s not a book that you read cover to cover. It’s a book that you keep on hand to be there to answer your questions when you want to know something about say, planting cruciferous vegetables. It’s an excellent addition for every gardener’s library.